(1) Several external lins and SIP trunks can be bind into one routing group for specific calls. (2) Different calls can be routed to different groups. MSS V14.2 (build 20130914) or abover versions can provide 'routing-group' feature to support above key functions. In MSS, one 'routing-group' can combine several external lines and sip trunks. Each routing in the same group will be selected in round-robin policy. 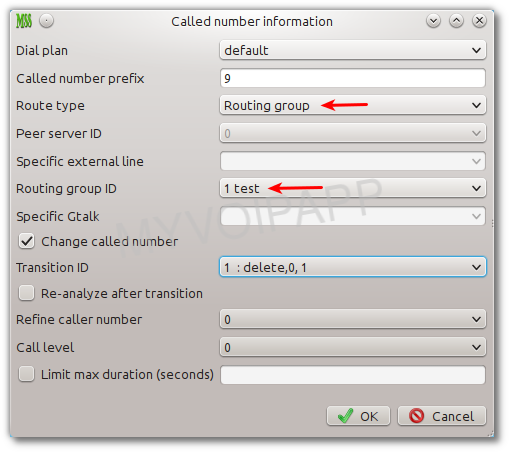 We can configure calls to different 'routing-group' by using 'dial plan' feature. 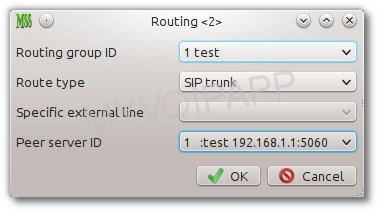 Since routing-group uses 'external line' or 'sip trunk', please confirm you have configured 'data / external lines' or 'data / peer server' rightly for normal routing. Then, we can continue our 'routing-group' configurations. Please click menu 'data / routing group / group' to configure group information. Here we only need define a 'group id' for subsequent configurations. Please click menu 'data / routing group / routing' to configure routing information. Below table illustrate parameters in this configuration. Routing group ID Group ID defined in above chapter 2.1. Route type It can be 'external line' or 'SIP trunk'. If it is 'external line', 'specific external line' item must be configured together. If it is 'SIP trunk', 'Peer server ID' must be configured together. Specific external line External line to be combined into this group. Please click menu 'data / external line' to configure your external line firstly. Peer server ID SIP trunk ID to be combined into this group. Please click menu 'data / peer server' to configure your SIP trunk. (1) 'Route type' must be 'Routing group'. (2) 'Routing group ID' must be indicated together, then MSS can know which group should be routed to.